copyright © 2016 ShofarProductions.com All right reserved. No portion of this website or ebook may be reproduced in whole or in part without the expressed written permission of the author and/or publisher. Regardless of what any person says, regardless of what cults teach, the only thing that matters is what the word of God teaches and reveals about Yeshua (Jesus). People and institutions may deny Yeshua is God, they may attempt to deny the Godhead (Father, Son and Holy Spirit), but the bible clearly teaches that Yeshua is God and the second in the Godhead (Col.2:9). In this ebook we will prove his deity. “And the Spirit expressly speaketh, that in latter times shall certain fall away from the faith, giving heed to seducing spirits and teachings of demons.” 1 Timothy 4:1. People need to stop listening to false doctrines that originate from the spirit of Antichrist. Instead, they should heed the words of God found in the scriptures, because God's word is designed to teach us truth if properly interpreted. “But whoever denies me before men, him I will also deny before my Father who is in heaven.” Matthew 10:33. If you deny Yeshua is God, are you denying Yeshua completely? YES! - Acknowledge you as a boss. - They refused to acknowledge you as one of the owners of the company. - They refused to acknowledge you had the same power as the other partners. -They respect the other partners, but only consider you one of the employees like themselves. Wouldn’t your employees be accused of denying who you truly are? The employees aren’t denying you exist as a person, they’re just denying who you really are – One of the Bosses! Therefore, in your own company your employees are denying all that you are – The boss, one of the owners, a person with authority in the business, a person who is above the employees in authority and has the power to hire, promote and fire. In the same way, people that deny Yeshua is God and part of the Godhead (Father, Son and Holy Spirit), are actually denying all Yeshua is. People are denying the fullness of his divine power, his authority and thus denying the fullness of who he is. Do you deny any of these things? Do you deny he is God and just relegate him to being only a man, only a created being? If your answer is YES, then you are denying Yeshua (Jesus) before men. The consequences of committing this act of denial will result in you being denied by him before the Father and his denial of you will result in your eternal damnation. Hopefully, after this biblical teaching you will repent of your denial of our God and Savior Yeshua/Jesus. Is this a salvation issue? Absolutely!! People that deny the deity of Yeshua /Jesus and think it's no big deal, really need to reconsider their thinking. These people believe the deity of Yeshua is just an optional subject that is left to a person’s own discretion. To them, getting it right or wrong about they deity of Yeshua is not a salvation issue. However, this type of thinking is 100% wrong and it will put you and others you teach under eternal damnation. If you believe Yeshua/Jesus is nothing more than a man, that he is NOT God in the flesh, then according to the scriptures you do not have salvation, it's that simple. Yeshua (Jesus) himself said denying his deity is a salvation issue. Who was he? He was the Messiah, the Mighty God and Savior. He pre-existed and came to us from heaven. He was the creator of all things, the I AM and the apostles all considered Yeshua/Jesus God. Yeshua gave a warning to the crowds that could not see past his humanity and denied his deity. He told them that they were destined to die in their sins if they denied he was God, "unless you believe "I AM" you will DIE IN YOUR SINS". The same warning applies to us today. Unless we accept his deity (that he is God) we will die in our sins as well. This is not optional as some believe. You need to get this issue right! You need to confess that he is 100% God and 100% man to avoid hell and to be saved. There is NO man nor a “little g” god, or a created being that will be our Savior. Yahweh (God) alone is our Savior and Yeshua (Jesus) is God the Son. Yahweh the Son, pre-existed (as described in John chapter 1). If Christ is only a man and not God in the flesh, then it would be impossible for him to pay the price for the redemption of even one man, let alone the redemption of all humanity. The word of God says the price for a man’s soul is too costly for another man to pay. Only God Almighty can be our Savior. A simple man cannot redeem you! A man cannot save you. Need proof? The bible clearly says a man cannot redeem another man’s soul in Psalm 49:7-8. Even Moses who had a special status with God (Exodus 33:11, Numbers 12:8 and Deuteronomy 34:10) offered to give his own life in order to save Israel, but Yahweh rejected his offer. And Yahweh clearly said he WILL NOT give his glory to another. Yahweh will not share his position, titles and glory with any person, angel, idol, creation or some “little g” god that men manufacture in their false teaching. Therefore, Yahweh (God) will not let a man or a creature become a Savior and Redeemer for the world. A man cannot be the one and final sacrifice for all of humanity. That is why Yeshua/Jesus, who is God (Yahweh the Son), was the only one qualified to be our Savior by the sacrifice of his body on the cross. The Apostle Thomas called him "My Lord and My God"
“Thomas answered him, "My Lord and my God!" John 20:28 – This is not a misprint, this is not a mistake and Yeshua never rebuked Thomas for calling him God. These confessions of the apostles are a divine revelation passed down to us in the scriptures so that we can know without a doubt that Yeshua (Jesus) is God. The next verse proves the statement Thomas made to Yeshua was directed to Yeshua/Jesus when he called him "my Lord and God". Verse 29: “Jesus replied to Thomas, ‘Because you have seen me, you have believed. Blessed are those who have not seen, and have believed.’"
In verse 29 Yeshua says, because you [Thomas] have seen me, now you believe. Believe what? Look at the Context. In verse 25, the disciples told Thomas “We have seen the Lord.” However, Thomas did not believe they had seen the Lord and said he would only believe the Lord was really resurrected (conquered death) if he sees Yeshua with his own eyes. Then later Thomas is face-to-face with Yeshua and the only response Thomas had seeing Yeshua face-to-face was: “My Lord and my God!" Some have said this is just a phrase similar to saying “Oh my God! !” or OMG in modern text talk, but the disciples would not take the Lord’s name in vain saying OMG, nor would they commit idolatry by calling a man or a created being “God”. The simple and only legitimate answer is that Thomas was clearly acknowledging Yeshua / Jesus was his Lord and his God. It should also be noted that the phrase “My Lord and my God!” used by Thomas is common in the Old Testament when praying or praising God. See: 1 Kings 3:7, 8:28, 17:20-21; Habakkuk 1:12; 2 Chronicles 6:19; Psalm 7:1, 18:28, 35:23, and 86:12. Additionally, it should be noted that Yeshua did not rebuke the response of Thomas in anyway whatsoever. Yeshua/Jesus took the response of Thomas as his confession in Yeshua’s deity and lordship (verse 29) “Jesus said to him, ‘Because you have seen me, you have believed.” Thomas believed Yeshua was the Messiah, the resurrected Lord, and he believed in the deity of Yeshua. According to Thomas, Yeshua is God clear and simple. The Apostle John Reveals Yeshua/Jesus is the Word and the Word was "God"
Who or what is the Word? Therefore, the “Word” in John chapter 1 is Yeshua/Jesus as revealed in the Book of Revelation and furthermore, the full context of John chapter 1 tells us who the Word is. The Word is alive, the Word is a person, the Word preexisted with the Father, the Word created and the Word was God as the Father is God. The Word is not an elevated person, a glorified man, or a demi-god. The Word is God just like the Father is God. Jehovah's Witnesses Say Yeshua/Jesus was "a god" which makes Yeshua/Jesus a small god that's in addition to Yahweh/God. This is false! The bible never teaches that Yeshua/Jesus is a lesser god or the Archangel Michael as the Jehovah's Witnesses believe. In order to validate their false teaching, they had to alter the writings in John chapter 1. Their New World Translation bible added the word "a" to John 1:1. The King James Bible says, "In the beginning was the Word, and the Word was with God, and the Word was God. ", which agrees with the majority of all English translations and 100% DISAGREES with the Jehovah Witness bible. The Jehovah's Witnesses insert an "a" in between "was ↓ God" and they turn God the Son into a lower case "g" so that it modifies the verse to fit their doctrine. Thus, it would modify John 1:1 to now read as: "In the beginning was the Word, and the Word was with God, and the Word was a god." In the original Greek the "a" does not exist. Why do the Jehovah Witnesses do this? In order to deny Yeshua/Jesus is God and make him into nothing more than a created being. However, if Yeshua/Jesus is not "The God", but a lesser god, then that makes the Jehovah Witnesses polytheist (worshipers of multiple gods) and it makes Yeshua/Jesus a created being turned into a god. Yet how can this be true? Look at John 1:2-3 which says, "The same was in the beginning with God. All things were made through him. Without him was not anything made that has been made." This means Yeshua/Jesus had the power to create like "The God" and everything was made by Yeshua. So, if Michael the Archangel was a created being, and Yeshua/Jesus created ALL THINGS, then how could Yeshua create himself? The Gospel of John defeats the JW's doctrine, which is why they have to play games with the scriptures in their translation of the bible. Even if you're not a JW, but still believe Yeshua is a created being, then ask yourself the same question. If Yeshua/Jesus is a created being then how could he create himself? Remember, according to the bible Yeshua/Jesus created ALL THINGS and without him WAS NOT ANYTHING made that was made, so how could Yeshua/Jesus create himself? The answer is simple, Yeshua/Jesus is not a created being and not a "small-g-god." Yeshua/Jesus is part of the Godhead, Yahweh the Son and he (Yeshua/Jesus) was in the beginning with Yahweh the Father and Yahweh the Holy Spirit. The three are one (Echad). In the beginning, what beginning? In the beginning of all things God the Father, God the Son and God the Holy Spirit existed together. They were not created they just existed together in the beginning. Did you notice the Greek does not say "and a god was the word" as the JW's want us to believe? It says "and God was the Word" which is properly translated into English as "and the Word was God." --- God was the Word = The Word was God -- The same meaning. Some people teach that the Word was just a dream of God, just a plan of God, just a concept of God, or a power source of God. However, the bible teaches that the Word of God was alive; The Word was a person of the Godhead that was manifested in the flesh and lived among the people of the 1st century. - “The Word became flesh, and lived among us. We saw HIS glory, such glory as of the one and only Son of the Father, full of grace and truth.” – Verse 14 -- The Word that pre-existed, the Word that was God, The Word that was with the Father, became flesh (a man) and lived among us. What was the Word that became flesh and lived among us? The Word was a “He,” a person, but even more the Word was GOD: “The Word was with God, and the Word was God.” – Verse 1. The Word was Yeshua, God the Son, and a member of the Trinity [ God the Father, God the Son and God the Holy Spirit]. “Without controversy, the mystery of godliness is great: God was revealed in the flesh, justified in the spirit, seen by angels, preached among the nations, believed on in the world, and received up in glory.” 1 Timothy 3:16 – This is speaking of Yeshua as being “God” in the flesh, who was believed on in the world and was received up into glory. Yeshua humbled himself into the nature of a man and finally to the cross for our salvation, but in the beginning he was God and equal with the Father. Notice Paul calls Yeshua the “Great God” a term also used to describe Yahweh (Deut. 10:17; Neh. 8:6, 9:32; Dan. 2:45 and more). The reason for this is simple – Yeshua is God the Son and part of the Godhead. Yeshua (Jesus) is not some “little g” god, or glorified man, but one of three divine entities (Father, Son and Holy Spirit) that make up a single body we know as Yahweh/God. Yahweh cannot use a human substitute to step in and be our redeemer, because the life of a man was not enough to save even one human soul. Only the GOD-MAN, Yeshua/Jesus, was uniquely qualified for the calling. The bible is clear about the serious nature of getting the facts straight about the deity of Yeshua/Jesus. Your salvation depends on you getting it right -- Don't deny Yeshua/ Jesus is God. If you deny that Yeshua is the Messiah (mighty God) that has come in the flesh, then the bible clearly makes known your spiritual status. If you deny Yeshua/Jesus is the Christ/Messiah (Mighty God –according to Isa. 9:6), then you are a liar, Anti-Christ, or Anti-Messiah. The point is that your denial of Yeshua’s deity puts you in serious spiritual danger, which proves once again that this is not a topic to be taken lightly. "Pele-joez-el-gibbor-abi-ad-sar-shalom" - Wonderful, Counselor, Mighty God, Everlasting Father, Prince of Peace. Clearly, we can see that since the Messianic prophecy of Isaiah 9 states the Messiah will be called "Might God" [El-gibbor] and there are other scriptures that use the same term referring to God alone (not a man), it should be obvious that if Yeshua is the Messiah-- he is also God. Proof Mary was a virgin: The Hebrew word hā·‘al·māh (Almah) can be translated either 'virgin' or 'young maiden,' but 70 Jewish scholars translated this Hebrew word into the Greek word “Parthenos” in the 'Septuagint' (The Greek version of the Old Testament), and parthenos is the same word used in the Matthew 1:20-23, which is a word that is only translated as a virgin. “But when he thought about these things, behold, an angel of the Lord appeared to him in a dream, saying, ‘Joseph, son of David, don't be afraid to take to yourself Mary, your wife, for that which is conceived in her is of the Holy Spirit. She shall bring forth a son. You shall call his name Yeshua, for it is he who shall save his people from their sins. ‘Now all this has happened, that it might be fulfilled which was spoken by the Lord through the prophet, saying, ‘Behold, the virgin [Parthenos] shall be with child, and shall bring forth a son. They shall call his name Immanuel;’ which is, being interpreted, GOD WITH US." Therefore, this is another inspired confirmation that the Messiah is God, which means Yeshua/Jesus is God. In Isaiah 44:6, the LORD (Yahweh) refers to himself as “the First and the Last”. In Revelation 1:8, 17, 22:12-13 Jesus also refers to himself as “the Alpha and the Omega” and “the First and the Last”. Therefore, what's the conclusion if Yeshua/Jesus takes the same names attributed to Yahweh alone? 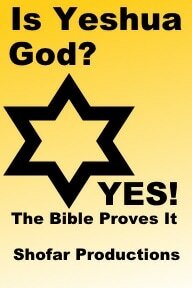 The simple answer is that Yeshua is God. In Zechariah 12:10 the LORD (Yahweh) is speaking and says that, “they will look on Me whom they have pierced.” (See also Psalm 22:16). Deuteronomy 6:4 states: “Hear, Israel: Yahweh is our God; Yahweh is one.” In the Septuagint is says: “AKOUE ISRAÊL KURIOS hO THEOS hEMÔN KURIOS EIS ESTIN, which is also the Greek wording found in Mark 12:29 when Yeshua/Jesus quoted Deuteronomy 6:4. Please note that Yahweh is YHVH –Lord/Kurios and Yahweh is also known as God/Theos. Therefore, both Lord (Kurios) and God (Theos) are titles for the one true God in Deuteronomy 6:4. What many people bypass is the fact that the Apostle Paul may have taken Deuteronomy 6:4 to prove Yeshua/Jesus is God. 1 Cor. 8:6b uses the same word Κύριος, which is also used in Deut. 6:4 to describe Yahweh in the Septuagint and the same word used in Mark 12:29 when Yeshua quoted Deut. 6:4. Therefore, what message could Paul be teaching in 1 Cor. 8:6? Paul was most likely using familiar terms (title - names) to show us that both (God the Father and Yahweh [Lord] the Son) are both part of the one and same Godhead. They are equal in their being and equally hold the status of God, while united in their nature and purpose under a single entity. Jesus (Yeshua) can't be the only Lord (Yahweh), because God the Father was also identified as Lord (Yahweh) in the Old Testament. There also can't be one God alone, because of the multiple scriptures calling Jesus God. Therefore, the only conclusion is that God the Father holds the status of being God and Jesus (Yeshua) holds the status of being Yahweh, which makes them equal in status, and nature. Get it? It's like having 2 police officers and calling one a cop and the other policeman. Aren't they basically the same thing, but just different terms? People have used this verse to refute the deity of Yeshua/Jesus by saying the scripture tells us there is only ONE GOD, but actually this scripture proves Yeshua/Jesus is God when you use the Old and New Testament scriptures to reveal his deity. Yeshua/Jesus is part of the Godhead (Yahweh), which is made up of Yahweh the Father, Yahweh the Son and Yahweh the Holy Spirit. Think about this also, if you say this scripture proves there is only ONE GOD, the Father (period), then you must use that same logic when it says there is only ONE LORD, Jesus the Messiah (period). Therefore, whenever we see "Lord" mentioned in the Old Testament, then according to your logic it can only be Yeshua/Jesus, because there is only ONE LORD (1 Cor. 8:6) and this scripture says that the ONE LORD is only Yeshua/Jesus. Clearly, Paul is trying to educate us that Both the Father and the Son are part of Yahweh/Godhead. "Therefore the Jews sought the more to kill him, because he not only had broken the sabbath, but said also that God was his Father, making himself equal with God." John 5:18 -- The Jews of the past understood what he was saying so why do people struggle with this fact today? “As they went to tell his disciples, behold, Jesus met them, saying, "Rejoice!" They came and took hold of his feet, and worshiped him.” Matthew 28:9 --- They had to bow down to take hold of his feet AND THEN worshiped him. The word for worship is “proskuneó” in the Greek, and it’s used to describe worship of the Father and the Son. It’s even used when talking about the people “worshiping” the image of the beast (Revelation 19:20), which was an abomination and idolatry. If Yeshua/Jesus is just a man, or a “glorified creation” from God as the false teachers claim, then the people who are telling you to deny Yeshua/Jesus is God are also telling you it’s okay to worship a created being in the same way you worship God the Father. It should be clear to you that Yeshua/Jesus was worshiped by the people, he never rebuked anyone that worshipped him, In addition, God the Father never spoke out from heaven about it and it was recorded in the Gospels for our education to know who Yeshua/Jesus truly is -- God the Son. “Saying with a loud voice, "Worthy is the Lamb (Yeshua/Jesus) who has been killed to receive the power, wealth, wisdom, strength, honor, glory, and blessing! I heard every created thing which is in heaven, on the earth, under the earth, on the sea, and everything in them, saying, "To him who sits on the throne, and to the Lamb (Jesus) be the blessing, the honor, the glory, and the dominion, forever and ever! Amen!" The four living creatures said, "Amen!" The elders fell down and worshiped.” Revelations 5:12-14 --- Here the Father and the Lamb (God the Son) are both being given the same praise and worship. Yeshua/Jesus is worshipped in front of the Father. Look at the next section and you will see that ONLY God can be worshipped. Can a man, angel, or creature be worshiped with God or as God? NO! Therefore, Yeshua is not an exalted man, a created being or an angel, but he is clearly God the Son and worthy of worship as God the Father is worshiped. "I am Yahweh. That is my name. I will not give my glory to another, nor my praise to engraved images.” Isaiah 42:8 -- But in Revelation 5:12-14, Yeshua/Jesus (the Lamb) is receiving the exact same praise as the Father. So if Yeshua is just a man, or an angel or a specially created being as some claim, then how can he be worshiped when the scriptures clearly forbid it? “Let no one divert you in false humility and the worship of angels…” Colossians 2:18 - Did you hear that Jehovah Witnesses? No worship of your version of Jesus, which you claim is Michael the Archangel. Did you hear that Mormons and Jehovah Witnesses? You can't worship your demi-gods. Yet all throughout the bible we see Yeshua/Jesus being worshiped. How can that happen if he is a creature or a "small-g-god"? More biblical proof you're doctrine is full of errors if you think a man, a creature or some demi-god can be worshipped. A child will be born [The Messiah] and he will be called “Mighty God” which Yeshua/Jesus fulfilled. He was manifest in human form to dwell among us and was called “God with us” (Matthew 1:23). He is even considered the “Everlasting Father” which does not mean that Yeshua is the first person in the Godhead, but simply that Yeshua takes on a fatherly attitude or likeness of a father. For example, Adam was the father of humanity, but the bible says Yeshua/Jesus is the second Adam (1 Corinthians 15:47), which means he corrects what Adam did wrong and brings his followers (children of God) into the everlasting kingdom of God as new people (1 Corinthians 15:48-57). In Yeshua (the second Adam), we have the power to become children of God (Galatians 3:26, Romans 8:19 and John 1:12). To debunk the claim that only God the Father is called “The Almighty” and the so called “lesser god” as the Jehovah Witness call Yeshua/Jesus, is only the “mighty God,” let’s watch the scriptures debunk the Jehovah Witness and anyone else who shares their faulty belief. Look at the following scriptures: Isaiah 10:21, Psalm 132:2 & 5, and Luke 22:69. All of these scriptures call God the Father “Mighty God” just like the Messiah is called “Mighty God” (Yeshua/Jesus). Therefore, the fact that Yeshua /Jesus is called Mighty God, as the Father is called Mighty God, is valid enough evidence that he is of the same essence (being) as God the Father. In fact, go to Isaiah 10:21 and it shows that the same exact Hebrew word used Isaiah 9:6, “Mighty God” is attributed to deity, thus showing that Yeshua (the Messiah) is deity as God the Father is deity. He is not a “small g” god, but part of the great Godhead (Yahweh). The Jehovah witnesses own translation proves that Yeshua/Jesus is called Jehovah (Yahweh). 2. Who is being described in these verses? It’s obvious the passage of scripture is speaking about Yeshua. Just look at what the passage is saying: “His Son is the radiance of his glory,” “You are my Son,” “I will be to him a Father and he will be to me a Son,” and “But of the Son he says.” The focus is on Yeshua/Jesus. “And, ‘You, Lord, in the beginning, laid the foundation of the earth. The heavens are the works of your hands. They will perish, but you continue. They all will grow old like a garment does. As a mantle, you will roll them up, and they will be changed; but you are the same. Your years will not fail.’"
This passage (Hebrews 1:10-12) is also talking about Yeshua/Jesus just as Hebrews 1:3-9 was talking about Yeshua/Jesus, but I want you to understand that this is a direct quote from an Old Testament passage (Psalms 102). 4. Read Psalm 102:21-27 and you will see that Hebrews 1:10-12 is speaking of Yeshua/Jesus, but the original Old Testament text was speaking of Yahweh (Jehovah), the Almighty. Even the translation used by the Jehovah Witnesses will prove that Psalms 102 is speaking about Yahweh/Jehovah. Yet, the Book of Hebrews uses this passage to describe Yeshua/Jesus. This proves Yeshua is equal to “God Almighty.” This also proves that the New Testament writers considered Yeshua to be God. Does the bible ever describe God the Father and God the Son as part of one entity? Yes! The Lamb (Yeshua) + God the Father = one Temple in the Book of Revelations. Therefore, if the Temple is one entity that is made up of two beings (Person[s]), then why do people find the trinity a difficult concept to comprehend? Here is another example of two members of the Godhead working together. Read Genesis 18 and 19 for the full context. Critics Ask How could Yeshua /Jesus be part of the Godhead when he said the Father is greater than he is (John 10:29-30 and 14:28)? These two verses are favorites with the crowd that deny the deity of Yeshua/Jesus. Some deniers of Yeshua's deity even say these two passages are the "final nail in the coffin for those who teach Yeshua is God". I say, don’t jump and shout in victory yet, because these passages prove nothing about Yeshua’s deity. In the context of the bible these scriptures actually prove that Yeshua is God. First of all, the fact that Yeshua says “the Father is greater than I” does not invalidate Yeshua’s deity. Let me prove this by an illustration and the scriptures. Let's say we have three generals on a military base who are trying to solve a problem with their privates on the base, so one of the generals agrees to strip off his rank and wear the rank of a private in order to dwell among the privates to solve the problem. This general was willing to give up all the benefits of being a superior officer and to lower himself to the lowest rank to help the privates. Officially this general was still was one of the highest ranking officers on the base, he was not demoted, but made the decision to pull off the general stars on his shoulder to voluntarily become a private. He was still fully a general, but at the same time he was fully a private and subject to the treatment, living quarters, pay, and duties given to a private. Thus, he was 100% a general, but also for the time being he was 100% a private. As a private this general was now subject to the orders of the generals he was once equal to. Therefore, in the form of a private he would say "the generals on the base are greater than I am," which would be very true as long as he remained a private. In the same way Yeshua/Jesus was fully God as the Father was, he dwelled in heaven with the Father, he also had the same power and authority as God the Father. However, Yeshua/Jesus left all the glory of heaven in order to humble himself in the form of a man and dwell among us. He was still fully God (100% God), because he always has been and always will be God --It's his nature and what he is, but he also took on the body of a man (100% man) so that he could sacrifice his physical body to atone for our sins. Let’s look at a few more scripture verses for clarity and additional proof of what we just illustrated. Let's break down this scripture to grab hold of the full message. - "Although he (Yeshua) was in the form of God..." The Greek word is "morphḗ" which means he was the full form and nature of God. - "And EQUAL WITH GOD..." Here we see that not only was Yeshua/Jesus in the form and nature of God, but he was also EQUAL with God. - "He did not take advantage of his EQAULITY..." What Equality? His equality with God the Father and Holy Spirit. - "He emptied himself..." Emptied himself of what? His advantage of being God. He wanted to be like us to give us an example to follow. - "Taking on the form of a servant..." He was once in the glory and splendor of heaven as fully God, but now he became a servant. - "By becoming like other humans..." He was God, EQUAL with God the Father, but now AS A MAN he is now a servant, humbled, obedient to God the Father as all men should be. Therefore as 100% man he is submissive to God who is greater than men. People have problems seeing Yeshua/Jesus in his dual nature, which is why they can't grab hold of the concept that Yeshua is and always will be 100% God and once he took on the form as a man he is and always will be 100% man. Because people have problems understanding the dual nature of Yeshua/Jesus, I am sure Paul had to simplify it for people as he does here in Philippians 2:6-8. Even in the first century there were Gnostics and heretics teaching weird doctrines about the nature of Yeshua/Jesus and even denying Yeshua was God or denying he was 100% man. 100% God: Yeshua/Jesus pre-existed in the form and nature of God and was Equal with God the Father. He was God the Son. 100% Man: He gave up his advantage of being God by emptying himself of his glory, by becoming a servant and by becoming a man who was obligated to submit himself to the full will of the Father who was now his God. John 1:1-3, 14 – The “Word” is Yeshua/Jesus (Revelation 19:13), who became flesh and lived among us. It also says “the Word” WAS GOD and was with God from the very beginning. The “Word” (Yeshua) created ALL THINGS. 2 Corinthians 8:9 – Yeshua left the riches of heaven and became poor for our sakes, so that we might gain the riches of the kingdom. Looking back to John 10:29-30 – Yeshua clearly states he and the Father are one. One in unity, one in the Godhead and one in nature. Why did Yeshua say: “…If you loved me, you would have rejoiced, because I said 'I am going to my Father;' for the Father is greater than I” in John 14:28? Because Yeshua was still living humbled in the form of a man when he made that statement and at that time the Father was living in heaven with the full glory of his deity surrounding him. Therefore, Yeshua tells his disciples “If you loved me, you would have rejoiced, because I said 'I am going to my Father.” Why should the disciple rejoice? Because Yeshua will soon regain all the glory he set aside when he humbled himself to come to earth in human flesh. Therefore, the disciples should have been happy for him and rejoiced for Yeshua. The understanding is simple. Yeshua/Jesus was about to go back home with the Father and will regain his former glory, which he had together with the Father, who was currently seated in heavenly glory already when Yeshua made that statement in John 14:28. However, even if you want to say the Father is greater than Yeshua, as in John 10:29-30, what does the difference in rank between the Father and Son have to do with denying or accepting the deity of Yeshua? Regardless of a rank in the Godhead, Yeshua is still the same essence as the Father; he is still God and still a member of the Godhead and always will be. Therefore, John 10:29-30 and 14:28, fails as a supposed proof text to deny the deity of Yeshua/Jesus, but these scriptures actually help explain his dual nature when merged together with the full context of scripture. How could Yeshua/Jesus be God when the bible says he was created? People think this verse is saying that Yeshua/Jesus is a created being, but this verse does not prove Yeshua/Jesus was a created being, nor does it deny the deity of Yeshua. Just merge this scripture with the context and totality of scripture to fully understand what this verse is actually saying. Go to Colossians 1:16-18 and read the explanation of what verse 15 is actually saying. So, what is the verse saying to us? - Yeshua is the firstborn of all creation and we will look into what it means to be "the firstborn". - FOR BY HIM all things were created, yet how could Yeshua create ALL THINGS if he is created? If he is part of creation, but was also the one who created ALL THINGS then how did he create himself? Colossians and other verses clearly say Yeshua created ALL things in the heavens, on the earth, visible and invisible. Those who claim Yeshua is nothing more than a created being need to explain how the creator (Yeshua) can create himself (we discussed this earlier). They also need to explain how a created being has the divine power to create, which is a power only attributed to God. - Not only has he created ALL things, but ALL things have been created FOR HIM. So this statement brings it to a whole new level. How can a created being not only have the power to create, but also the authority to create everything in heaven and earth for himself? - This verse tells us he pre-existed before all of creation. If he created ALL THINGS in heaven and earth then shouldn’t this be proof that Yeshua/Jesus existed before everything was created? This would mean that Yeshua/Jesus pre-existed before the heavens, angels, Lucifer, the earth, animals, fish and man were even created, because it was Yeshua who created ALL THINGS. - He is before all things. Here the scriptures makes the concept clear that he is before ALL THINGS. The scriptures want you to fully understand that Yeshua pre-existed before all of creation. - In him (Yeshua) ALL THINGS are held together. Now this so called creature, not only created ALL THINGS, which is something that only God can do, but now this so called created being is also holding ALL THINGS in the heavens and the earth together. So the question again is, how can a creature have this much divine power and not be God? If you believe that Yeshua is nothing but a man, then how could a man create and have the power of God? If you believe that Yeshua/Jesus IS divine, but not on the same level as the "Almighty God" then you're believing in and teaching there are other gods besides Yahweh, with the power to create and hold the universe together. This makes you a polytheist (believer in multiple gods) like pagan Hinduism believes. - He is “the beginning”, which is another attribute of God. See Isaiah 41:4, 44:6 and 48:12. John chapter 1 proves Yeshua was in the beginning with the Father and that Yeshua was God like the Father. In the Book of Revelations Yeshua/Jesus uses the same title as the Father. He said he is the Alpha and Omega, the First and the Last. - The firstborn of the dead. There is no clarification concerning who the dead are in this verse, so therefore, we can only assume he is the firstborn of All the dead from Adam forward. In regards to the term “firstborn” which has been used twice in this passage of scripture, as stating Yeshua is the “firstborn of all creation” and he is “the firstborn of the dead”, I think this term “firstborn” brings confusion to people who don’t fully understand the concept of the firstborn. This lack of understanding about the "firstborn," is why so many Unitarians (people who deny the trinity) believe Colossians 1:15-18 is their solid “proof text” for their belief that Yeshua/Jesus is nothing more than a man or creature. People need to understand that the term “firstborn,” is more of a status and not necessarily proof of being the actual first to be born. - Ishmael was born before Isaac, but Isaac was the son that received the firstborn blessing (Genesis 17:19-21). - Isaac had twin sons, Esau and Jacob. However, God appointed the older to serve the younger (Genesis 25:23) and later, Esau gave up his birthright as the firstborn to Jacob (Genesis 25:31-34). So we have multiple scriptures showing us that being the firstborn does not always mean you are the first to be born. Jacob called the legal status of the firstborn a position that reflected preeminence of dignity and preeminence of power. So what do we see in Colossians 1:18? Yeshua has the status of being the firstborn of all creation and all of the dead, so “that in all things he might have the preeminence.” Yeshua has the preeminence (authority and power) over all of creation and over all who have died, because he created all things and because he was the first among men to conquer death. Just like mortal men were gifted the status of the firstborn without being the actual first to be born, we can also see that Yeshua/Jesus earned the status of the firstborn and the one that holds preeminence over all of creation without himself being created. His physical body died and was resurrected from the dead so he conquered death and now has preeminence over death, which means he holds firstborn (preeminence) status over all the dead. Paul in the book of Colossians is not saying Yeshua is a created being, but rather showing he is the creator of all things and has authority and preeminence over all of his creation from life to death. Men and women in the era of Paul fully understood the authority behind the status of the firstborn, thus Paul used the status of the firstborn to illustrate the power and authority Yeshua holds. Just read Colossians and allow the context explain the content. Critics ask How can Yeshua/Jesus be God if he died on the cross? God cannot die! Spiritually Yeshua/Jesus lived after his death on the cross (Luke 23:43, Acts 2:25-27, 1 Peter 3:18-20, and Ephesians 4:7-10) because Yeshua only died physically on the cross. For those who say Yeshua cannot be God, because God cannot die, well let me give you the explanation. God the Son took on the flesh of a man and that flesh died on the cross, but the spiritual part of Yeshua/Jesus never ceased to exist. Three days later, his flesh was resurrected and reunited back with his spirit and soul. He was no longer separated from his body, but now had glorified resurrected body. All during the 3 days and 3 nights that his body laid in the tomb, Yeshua spiritually never ceased to exist. Therefore, the argument that Yeshua cannot be God, because God cannot die, is faulty and shows a lack of understanding of what happens to the soul and spirit after death. The soul and spirit are eternal and live on after our physical bodies die as proven by the scriptures. Only those who believe in the false doctrine of soul sleep have difficulty understanding the biblical truth. Clearly, Yeshua lived on after his physical death. We already listed this scripture as proof Yeshua/Jesus lived on after the death of his body. Just look at what he promised the thief on the cross. Yeshua died physically, yet he promised the thief on the cross that that very day the two of them would be together in paradise. God the Son never ceased to exist, so critics of Yeshua’s deity cannot continue to use the argument of his physical death as their excuse to deny his deity. Spiritually, he was very much alive after the cross (Acts 2:25-27, 1 Peter 3:18-20, and Ephesians 4:7-10) and Yeshua never ceased being 100% God on earth or after death of his physical body. This is just a brief list of the evidence among numerous scriptures that prove the deity of Yeshua. We could have used many more scriptures to refute the false teachings of those who deny Yeshua/Jesus is God, but we wanted to keep this ebook as short as possible. The whole bible proclaims the deity of Yeshua if you properly interpret the scriptures in the full context of the bible. The evidence is right there in your own bible, but you must read it without the filter of faulty teachings preventing you from discovering the truth. Remember that this topic is far too important to take lightly. Your salvation depends on you getting it right concerning Yeshua/Jesus being God (member of the Godhead). He is not just a man and he is not a special created being, he is not an elevated man, he is not a demi-god, nor is he one of the angels. 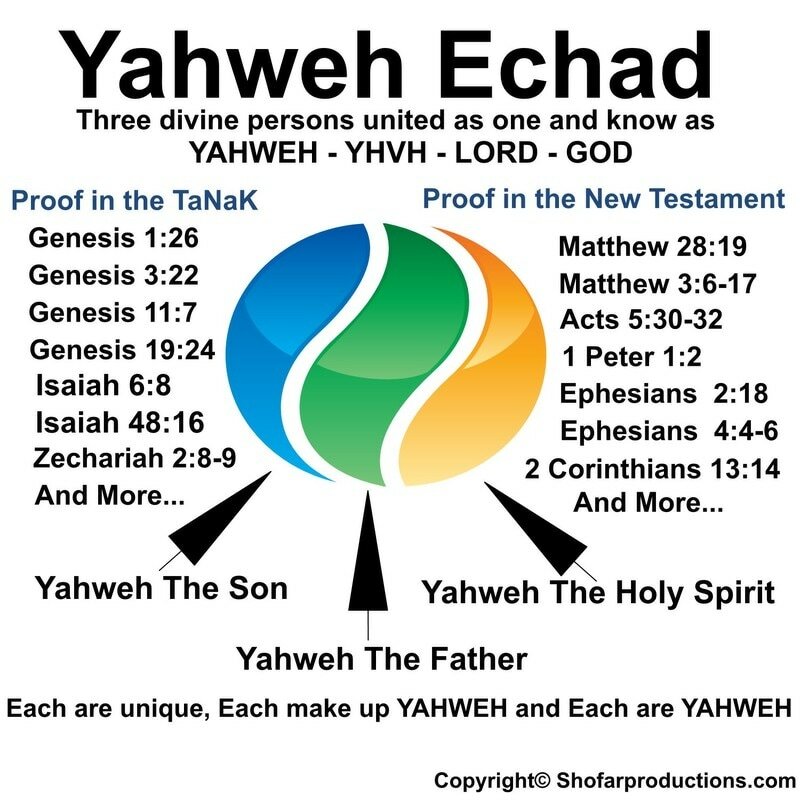 Yeshua is “Yahweh Echad” which is Yahweh the Son united with Yahweh the Father and Holy Spirit forming one “Echad” God. This is what the bible teaches, this is what we should believe and teach, because our salvation depends on us understanding the true nature of our Savior and teaching others the same. The original Greek text does not have the word “he” in it, so what Yeshua/Jesus was actually saying is that “You will die in your sins, for unless you believe that I AM you will die in your sins.” The point of his warning is even clearer when we tie it in with his previous statement. He is letting them know he is not just a man, because he's from above. He did not come from this world, but from heaven because he's the great I AM. Several times in scripture we see Yeshua connect himself to the “I AM” title of Exodus 3:14. Therefore, you can continue to deny Yeshua IS GOD at the risk of your salvation, but you can never stand before the judgment seat of God and claim you were never warned. In John 8:23-24, Yeshua himself warned you directly from his mouth and his words are recorded in the scriptures for generations to see. For the sake of your salvation you must believe Yeshua IS GOD! I am not talking about believing he’s a mini-god, or some glorified creation. I am saying you must believe he iS GOD just like the Father is God and the Holy Spirit is God. They are a unified (one/echad) Godhead, also known as the Trinity. They’re not three separate God’s operating on their own. They’re three equal entities in status and nature that are united to make up one unified Godhead, one unified Yahweh. You need to avoid all the man-made doctrines that twist the scriptures and say it’s okay for you to commit idolatry by worshiping a demi-god, an exalted man, or a created being. Yahweh has never allowed idolatry, so why are these false teachers telling you Yeshua/Jesus is just a man, just an angel or just a created being and then they tell you it’s okay to worship that man, that angel or that created being? Aren’t they telling you it’s okay to commit idolatry by worshiping a creature? Shouldn’t this alone be a red flag warning that their teachings are wrong and misdirected? Thank God Yeshua/Jesus is not a man, not a demi-god and not a creature. He is God, the mighty God, the Almighty God, the Alpha and Omega, the first and the last. He is God as the Father and Holy Spirit are God. So get rid of the false teachings about Yeshua/Jesus and believe in the truth that Yeshua/Jesus is the “I AM” so that you won’t die in your sins. Yeshua/Jesus is fully God so he is worthy of our praise and worship. Yeshua was worshiped on the earth and worshiped in heaven in the presence of the Father. Yeshua did many things that are only attributed to God and he has powers that only belong to God. The evidence for his deity is overwhelming, yet the argument of the deniers fall apart when challenged with the context of scripture. These false teachers want to teach you lies about your Savior. How much do you need to see before you agree their doctrines are completely wrong? Yeshua is God the Son, your Savior. Get to know him for who he is and live in true salvation. Think for yourself, pray God reveal the truth and keep you from error. Let the Father, Son and Holy Spirit reveal their nature and truth to you. Yeshua/Jesus will reveal he is God! Copyright © 2014 Shofar Productions. All rights reserved. This site and associated content may not be copied or duplicated without The express Written permission from shofar productions. All Logos appearing on this website are a trademark of Shofar productions.